Screen mirroring - the ability to display the content from one screen, like your tablet, on to an HDTV - is becoming more and more common, especially as the hardware and software are being packaged into many newer TVs. 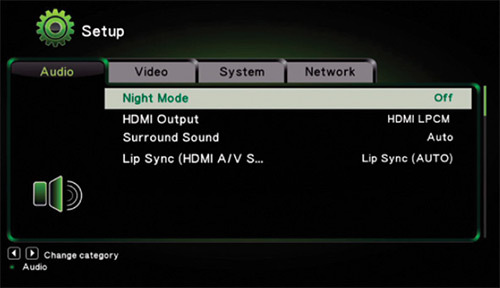 Of course, many older model TVs do not have this ability built into them. To screen mirror successfully on to these displays, you will need an accessory like IOGEAR's GWAVR, which wirelessly connects to your laptop or smartphone and transmits the signal through an HDMI cable to your HDTV or projector. 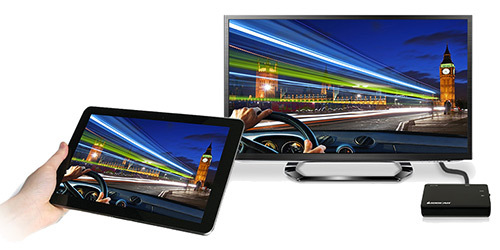 When your device is connected through the GWAVR, whatever is displayed on your screen is reproduced on the TV. If you are streaming a movie from Netflix on your tablet, it will also play on the TV with audio in HD resolution. If playing an app like Netflix or YouTube is the extent of your screen mirroring, then Google's Chromecast is a cheaper alternative. The GWAVR is more appropriate when you want to mirror content on your laptop or tablet that is not streaming from an app. For example, you have prepared a PowerPoint presentation on your laptop for an out of town business meeting. Pack the GWAVR with your laptop. When you arrive at your conference room, plug the GWAVR into the HDTV or projector and you can wirelessly mirror your PowerPoint from your laptop across the room. Of note, the GWAVR communicates with Intel WiDi and Miracast Certified Devices (more detail in the next section). 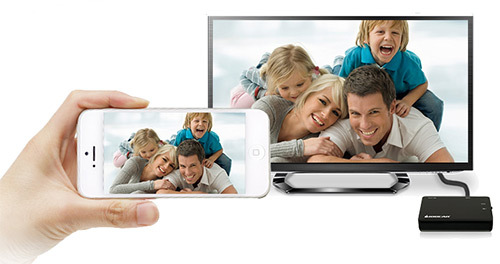 If you are using a non-Miracast device like an iPhone or iPad, you need to download the free "iMediaShare" App. Basically, check to assure that your device will work with the GWAVR. For example, the iMediaShare app requires iOS 6.0 or higher, which excludes the first generation iPad. Also some computers and laptops are not WiDi compatible. With that said, when connected to a matched device, the GWAVR performs as advertised and could prove indispensable in certain situations. 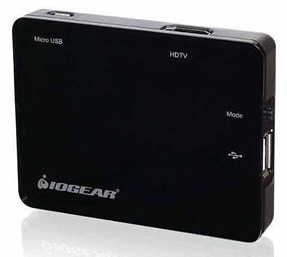 The IOGEAR's GWAVR is an unassuming little black box. On the sides are a USB port for service and future upgrades only, a USB Micro-B Port where you plug in the power supply, an HDMI out to the TV or projector and a Mode Button to switch between WiDi / Miracast and AirFun modes. On the inside is a wireless A/V receiver operating on 2.4 GHz and 5GHz frequencies. The wireless range is up to 30 feet. The GWAVR supports 1080p HD video and 5.1 surround sound. There is no remote control provided and none is really needed since you can play and control the streaming content through your mobile device. 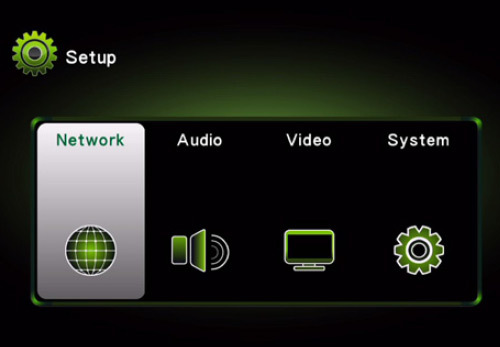 But if you dig through the manual, you will find instructions on how to connect your remote device to the GWAVR and pull up a virtual remote (see photo on right) from the IOGEAR website, which will give you the common buttons. About that device, IOGEAR lists a set of requirements. From my experience, that list is not all inclusive, partially because new devices are constantly coming out and the term Miracast is not always used. For example, the Windows phone has an application called "project my screen," which works with the GWAVR in the Miracast mode. To check to see if your mobile device is Miracast-certified, follow this link to the Wi-Fi Alliance website. 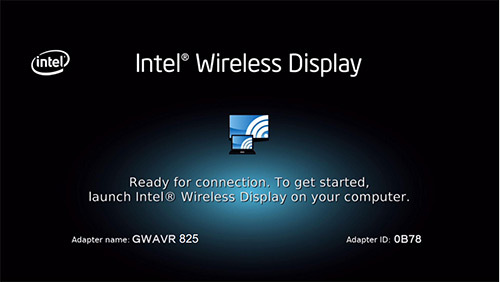 Also, if you plan on connecting your laptop to the GWAVR through the Intel WiDi method, even if your laptop meets the right hardware specifications, you still may have to download a software upgrade if your laptop is not running Intel WiDi version 3.5 or higher. You can download the current version on the Intel website. I will not detail the steps for connecting your device to the GWAVR. 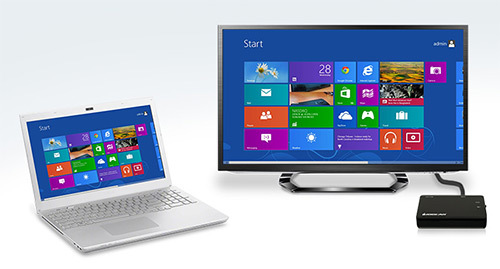 Basically, there are three different protocols depending on the capabilities of your laptop, smartphone or tablet: Intel WiDi, Miracast certified and Non-Miracast certified. In the GWAVR manual, IOGEAR does a good job of guiding you through the procedures. From my testing, I think that working with non-Miracast devices through third party software is a little more difficult than the other two more direct methods. On a side note, the GWAVR contains an Advanced Settings menu which you access through the Virtual Remote mentioned in the previous section. 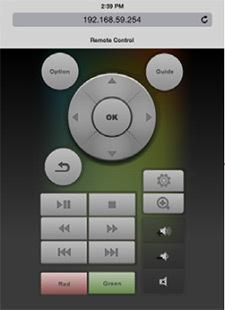 By punching the Settings button on the virtual remote, you are provided with four sub-menus where you can adjust options like the method of decoding audio information digitally: LPCM, RAW or Auto. To a large extent, the IOGEAR GWAVR serves as a conduit between your laptop or mobile device and the TV or projector. Remember, this process is called "screen mirroring." If the content on the screen that the GWAVR is mirroring looks bad, then the image that the GWAVR outputs will look bad. If you are mirroring content from an app like Netflix, and the stream is choppy or the image is blocky coming from your device, don't expect the GWAVR to miraculously clean it up. But if your device is outputting pristine content, then the GWAVR does a very good job of maintaining that quality. On their website, IOGEAR lists the GWAVR at $90, but I'm finding it at online retailers for as low as $65. If you are just looking to stream apps like Netflix onto your non-Internet connected HDTV, then the $35 Chromecast or a Roku box is a better option. Where I see the GWAVR setting itself above and beyond simple streaming is its ability to wirelessly mirror anything that you can display on your laptop screen, including content like PowerPoint presentations. In these situations, the GWAVR is a good value proposition. The IOGEAR GWAVR provides a straightforward solution to screen mirroring content from Intel WiDi laptops and Miracast certified mobile devices. If you have a non-Miracast device like an Apple tablet or smartphone, the connection process is not as direct, but it does work.